Shopping in Delhi is an Indian experience you won't forget. From dusty streetside markets teeming with locals to modern multi-level shopping complexes and boutique designer establishments, there's no shortage of options. And then there's the sellers perched along the footpaths and lingering at every tourist site. It's practically impossible not to buy in India. Here's a guide to just a few of Delhi's shopping havens. Get amongst it in Chandni Chowk - but if you don't like big crowds don't bother. Once a major trading centre of Asia, this market is swarming with people to navigate your way through - more than usual for Delhi - and at times there are bikes, bullock-drawn carts and cars to dodge too. Consider it an adventure! Chandni Chowk has the busiest and cheapest markets you'll find. It's where the many of the other sellers in town go to get their goods, so why not go straight to the source. You'll find a bit of everything - books, clothes, shoes, leather goods, electronic goods, food stalls and an immeasurable number of other matter. Don't miss the narrow side-lanes for even more options and a few surprises too. Centuries old, Chandni Chowk was established in 1650 when Mughal Emperor Shahjahan shifted his capital from Agra to Delhi and wanted a market just across the road from his fort - Red Fort, perched at the end of the shopping strip. Also known as CP, the area offers a mix of shops, restaurants, bazaars and cinema halls packed into two concentric circles that wrap around an expansive circular park at the centre. It can be easily categorised into two areas - Inner Circle and Outer Circle. Situated in the heart of Delhi, CP is a popular place to shop. Amongst the colonial-style buildings with colonnaded verandahs you'll find over 400 retailers, including branches of all the major International banks, a number of tour operators, tourist-friendly food joints, modern local brands and some western outlets too. Branching off the circular ways are sub-markets and an air-conditioned underground market, Palika Bazaar, dominated by electronic items, clothing, fake designer products, pirated software and other illegal bits and pieces. The prices down here are low, but be careful and watch your bag. CP is closed on Sundays. India's five-star luxury mall, this is the perfect place to exchange the dust and smells for high-end designer extravagance. With an Italian marble, burnished wood and detailed brass interior, you'd be forgiven for thinking you were in the middle of Paris or Milan (just don't look out the window). Showcasing only the top international designers, the likes of Giorgio Armani, Louis Vuitton, Cartier, Fendi, Dior, Just Cavali, DKNY, Burberry and Hugo Boss retail here, the only place in India you'll find the real versions. Lap up the luxury to the sound of the classical pianist playing in the central lobby. Whatever you do, don't miss the floor dedicated to India's top fashion designers. Ranging from traditional garments to impressive modern-twists on conventional ideas, the colours are mesmerising, the designs stunning, and the results tempting to the hip pocket. Dilli Haat is the first ever permanent craft market showcasing handicrafts from all over India. It's a project created to bring together the many different styles and techniques of craftsmanship and handicrafts iconic to each state. Rows of bangles, silks, fabrics, decorative ornaments, furniture, leather goods, rugs and spices - and as always much more - are presented well for browsing along the organised stall setups. Created to imitate a village fair atmosphere, there are also open-air stages for traditional performances from across the country, and a wide range of cuisines. Not quite a traditional market, Dilli Haat is definitely the tamest ‘market' you'll find in Delhi, and if you're not travelling throughout India this could be a good chance to see the traditional variances. With 62 stalls, spaces are allotted on a rotational basis to vendors who would otherwise be limited to selling within their own village. Barter hard to bring the prices down. There's also a small ticketed entry fee: 15 Rupees for adults and 5 Rupees for children. Stretching north of the Imperial Hotel, the streetside Janpath Market tinkles with everything from chimes, trinkets and pocket-sized souvenirs to shawls, clothes, pillow covers and colourful crafts. Well known for its wide variety of fashions, the market includes street-side shopfronts and vendors who simply spread their garments and handicrafts along the footpath and pinned up to the walls. You can even get your ears pierced in the street with some dangly new earrings, if you're game. Next to Janpath you'll find plenty more crafts and jewellery at the Tibetan Market, and Connaught Place is just up the road. Janpath Market is closed on Sundays. Pulling into the driveway at Merribrook Retreat in Western Australia's glorious Margaret River region, a forgotten yet welcome wholesome feeling takes over. Rolling onto the dirt track sidelined by virgin forest we come across a sign pointing to reception, even though we haven't spotted a single other building yet. Originally-owned and hosted boutique accommodation, Merribrook Retreat is perched on 160 acres of natural bushland, maintaining its private, luxurious and escapist vibe with just 10 architecturally-designed villas on offer. Warmly greeted by Lorraine and Richard, who founded Merribrook in 1984 and built it from ground up over the years to follow, we are immediately made to feel welcome and easily make ourselves at home. 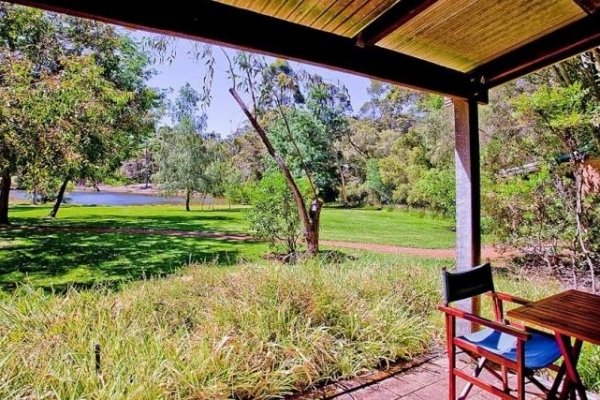 Despite being located just off a main road and close to wineries, galleries and townships, the retreat is perfectly set in a peaceful valley where the sounds of birds, insects and frogs provide a peaceful backing track and kangaroos freely hop through the grounds. The true beauty of Merribrook Retreat however lies in its ability to be exactly the kind of holiday you are longing for, whatever that may be. 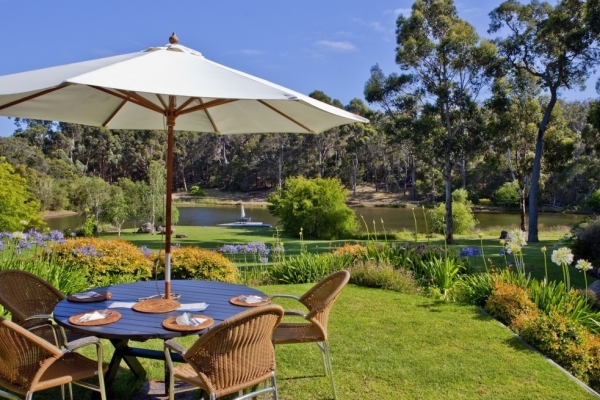 It's the perfect base to explore the Margaret River region's tourist hotspots, as well as a remote sanctuary for those wanting to completely escape all that bustle. It functions as a beautiful conference, training and team-building site, and for those seeking an active holiday there are many peaceful trails to walk, winding roads to ride and beautiful oceans to swim nearby. With only 10 villas to share all common facilities between, it's not hard to find yourself a quiet spot to relax in. Boasting the largest private pool in the district - 20 metres long and solar-heated - as well as a gorgeous spa with starry sky views and a Swedish sauna, be sure to pack your bathers. If you find water more relaxing to look at than to swim in, the retreat is perfectly perched on a slope overlooking a freshwater lake, with views from all around the grounds. 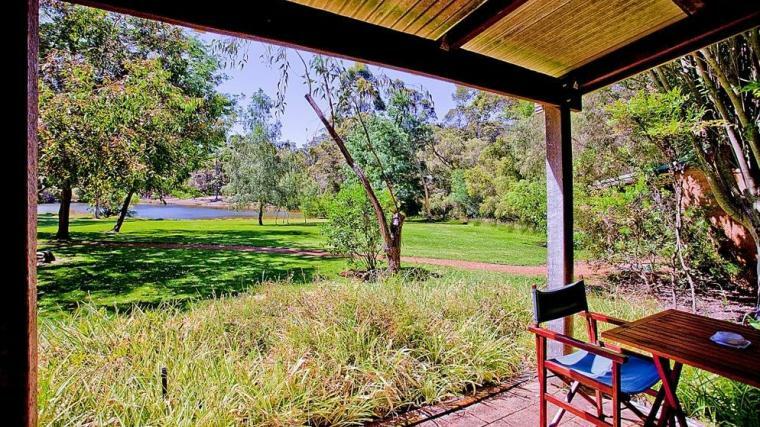 A small deck and chairs await by the lake, while there's plenty of grass to picnic on. The Lakeside Lodge, surrounded by beautiful gardens, is a great place to seek respite from your room during an extended stay. The lovely outside verandah overlooks the lake whilst inside it feels much like a warm and cosy ski lodge. You'll find books and DVDs to borrow and tea and coffee making facilities for any time of the day. In the winter, there's even an open wood fire to curl up by. If you aren't heading out to sample the local restaurants at night, a fully stocked commercial kitchen - and a BBQ on the verandah - is available for guest use. Breakfast however is included. That you will be thankful for. Consisting of a starter buffet of fresh seasonal fruits, cereals, muesli, toast, pancakes, muffins and sweet breakfast loaves, a few different options for a cooked breakfast follows. Locally roasted Yahava coffee and speciality teas are also served. 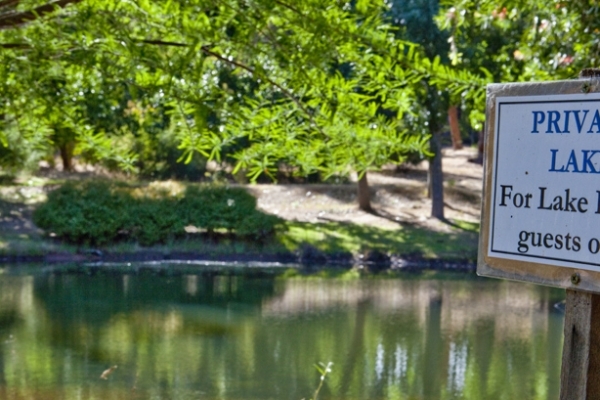 Merribrook's Lakeview Deluxe Villa provides a high level of comfort for two. It boasts a private verandah and ceiling-to-floor glass offering uninterrupted views over the freshwater lake. Features include a Queensize bed and daybed, exquisite bathroom facilities and a deep double bathtub, and a fan and heating for temperature control. The Forest Edge Garden Villa suits those looking to bring a few extra people. Recently refurbished, these villas are set amongst beautiful gardens and orchards. Features include a Queensize bed and single daybed in the bedroom, as well as a table and chairs alongside a Queensize bed and single daybed in the main room. It also has a modern bathroom and heating. The Luxury Lakehouse is Merribrook's answer to your perfect romantic weekend away. 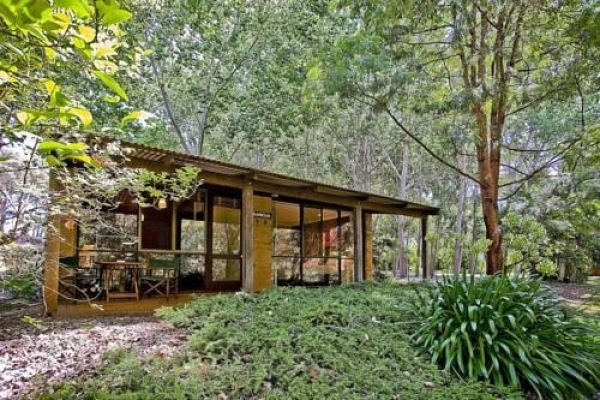 Situated well away from the rest of the retreat, and with its own private driveway entrance, full privacy is guaranteed. Fully self-contained, the Luxury Lakehouse boasts its own outdoor starlit spa bath, a natural outdoor shower, and a private deck with BBQ facilities overlooking a small lake. It also features plenty of living space including a couch and kitchen, a Japanese-inspired bathroom, Kingsize bed, reverse cycle air-conditioning, and beautiful robes, candles and flowers to set the scene. If you should wish to leave your hidey hole, breakfast is still included at The Lodge. All rooms feature a CD and DVD player, iPod dock, small fridge, tea and coffee making facilities. Private massage and pampering services are also available in your villa, which are very popular. It's advised to book ahead. A three-kilometre walking/running circuit brings the chance to see more of the Merribrook property if you're feeling active or looking to immerse yourself in nature. Stroll past lakes, mature cork oak, olive and stonepine plantations, and if you want to bring your own bike, you can even ride the track. For the serious walker, consider the Rails to Trails Track, a five minute drive away, as well as the Cape to Cape Track from Cape Naturaliste to Cape Leeuwin, accessible just four kilometres away. Merribrook Retreat offers Cape to Cape Walking Escape Accommodation Packages, which includes pickup and dropoff each day of your self-guided walk. From the beautiful coastline to the fresh green forests, and with many charming towns in between, the Margaret River region is world-famous. A prime wine-producing district, there are some 200 vineyards and 90 wineries to choose between, as well as a number of quality cheese and chocolate factories. Crowds also flock here to experience some of the best surf along the West Australian coastline. Top-notch restaurants, galleries, and arts and crafts outlets also add character to the region. 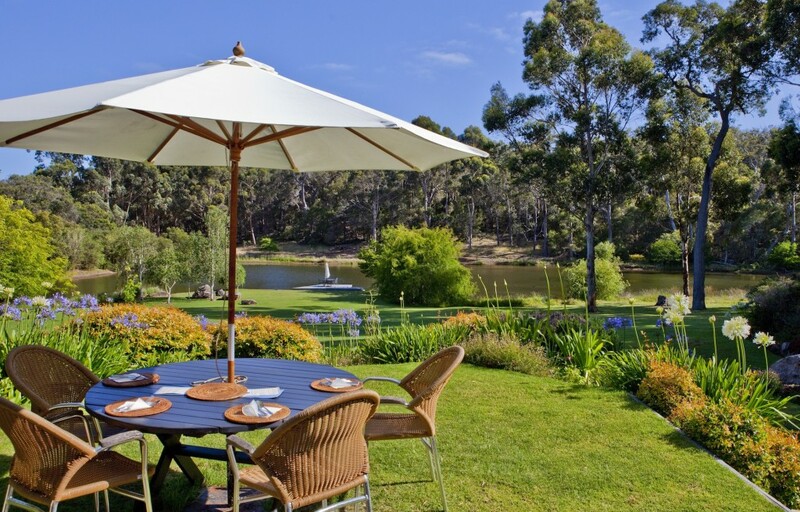 If you plan to really explore, consider buying the Margaret River Gold Pass to get the best value out of your Margaret River holiday. From the suburban Brisbane street, Spicers Balfour Hotel evokes a tinge of mystery with its modern, bold design sprouting a distinctly Queenslander-style wraparound verandah. Swathed in moody indigo hues that shimmer beneath the lights by night, one can’t help but wonder what’s inside. Originally a Queenslander house built in 1901, a three-year long overhaul transformed the building into a suave yet welcoming boutique hotel far from its airy timber origins. The newest addition to the luxury Spicers brand, it’s the only inner-city residence, yet still captures the same intimate escape. Stepping into the lobby and wandering upstairs to reception, the blues that captured me were met by chirpy purple tones, a sparkly chandelier suspended over the counter. Although the feel is now more European than Queenslander, a few telltale signs hint at its 110-year heritage. A replica of the original front door leads onto the verandah, original mouldings and trims feature in the common area along with revamped exposed beams overhead, and leadlights have been switched around to create an interesting mix combined with the dramatic furnishings. Standing at the reception counter, a wooden chessboard over to my left caught my attention, perched in the common lounge area by a congregation of velvety chairs, sidelined by a tall, dark bookcase offering anything from fiction to art history reads. My host, friendly and without the stiff smile, then showed me to my room down the dimmed hallway lined with colourful artworks by leading Australian artists. After a poke around my room – comfortable yet stylish – to the sound of the smooth jazz radio beats left on for my arrival, I ditched my bags and head upstairs having arrived in perfect time for canapés at the rooftop bar, served daily between six and seven o'clock. From cocktails to cognacs, liqueurs, beers, wines, port and vintage champagnes, the high-end class of the hotel is represented in the bar list. But there are plenty of options still priced at the same you’d find anywhere down the road in hip and happening New Farm. Whilst the small outdoor bar area would have been tempting if there were stars, I instead found refuge from the drizzly weather inside by the bi-fold windows. Looking over and between the local tin rooftops and sturdy Jacaranda trees, the Story Bridge dominated the night skyline in front of the city, its peaks lit in lines of blue lights. Whether it was the view or the smooth latin beats that soon switched into jazz – amplified by the wondrous and free Friday night feel – my crisp drop of sauvignon blanc glided down ever-so-smoothly. After heading out and about until nearly midnight, returning to a warm towel rack was the deal-breaker that landed me in a hot bubble bath. Of the nine rooms, four have baths and deep ones at that, which are spread across the room types. The four Executive Rooms on the central level are great for short stays, whilst the one-off Terrace Suite boasts a well-sized private slice of the verandah overlooking the front garden. On the bottom level, as well as a small room with some exercise equipment for guests, the Courtyard Rooms offer a little extra breathing space with a small courtyard lined by green bamboo plants. Bold and sleek inside, unique furniture pieces complete the style whilst laptop workstations come in surprisingly handy. And the LCD TV provided perfect Will and Kate royal wedding replay screening. Located on the cusp of the city, in trendy New Farm, here you reap the benefits of being close to the city but without the sounds of traffic whirring below. Walk out the front and turn right, pace 300 metres, and you’ll discover a grassy cliff-top park with one of Brisbane’s quietest and nicest views down over the winding Brisbane River, through the Story Bridge and to the city. Otherwise turn left, pace 100m, and find yourself standing on Brunswick Street amongst the plethora of quality cafes, restaurants and bars. Try restaurants Ortiga, Dell’Ugo or Anise. Room packages are inclusive of continental and à la carte breakfast, which can be enjoyed inside or out on the verandah speckled with rays. Also open to the public by reservation, chef Tyson Buchanan offers a great selection to start the day – from exotic jams and granola to French toast brioche and eggs how you like. Asking the host for her opinion, I went with her favourite, Eggs Benedict, to accompany my cappuccino and freshly made pear, pineapple and ginger juice. Upon placing my reservation, Spicers Balfour confirmed any special dietary requirements, so my breakfast came perfectly on gluten-free bread as well. With a flick of the paper and a gaze over the quiet street, it was time to pack my bags and say goodbye. This special spot may be more European than Queenslander these days, but the homely feel still lingers. There are no ‘good’s or even ‘great’s scribbled in here, it’s more like ‘wonderful’, ‘amazing’ and ‘fabulous’, as well as ‘homely’ and ‘welcoming’. Set on three acres in the majestic Port Stephens, at the south-east edge of Tomaree National Park, The Batch is a charming bed and breakfast perfect for a weekend getaway for two. Nestled at the end of a quiet street, but off a busy main road, this warm home-style oasis lies almost hidden amongst the array of activity in the port, radiating a sense of old-world charm and seclusion. Boasting beautifully manicured gardens, a salt-chlorinated pool and backing onto a block of bush land, geese and ducks wander about, you may spot a koala or two clinging to trees nearby, and the proud resident peacock often loves to show off his exotic fan of colourful, metallic-fringed feathers. The standout choice would have to be The Donga, perfect for a romantic getaway. It’s your answer to a private ‘adults only’ flee from everyday life. Nestled in its own garden at the back of the property away from the main house, The Donga features its own jacuzzi, an outdoor shower for starry night-sky views, and a fully self-contained bush kitchen including cook top, microwave, fridge and BBQ facilities. Also boasting an air-conditioned queen-size bedroom and expansive wooden decks to relax on, you could easily hide away for days, if you please, without ever leaving. The flat screen TV and DVD player may be tempting, but the nature at your doorstep is so much more inviting. Relax on the deck at night, bubbly in hand, and hear the surf pounding the shores in the distance. 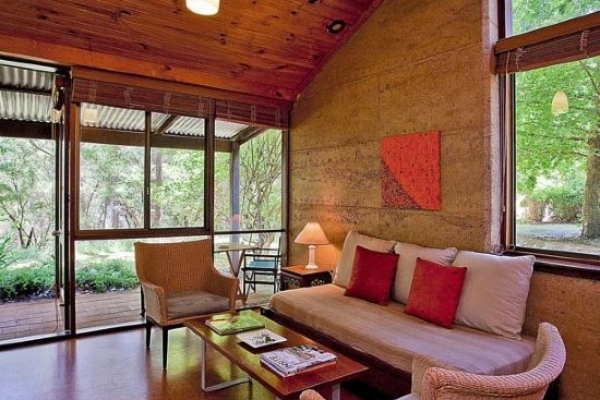 Back at The Batch, the expansive two-level cedar house, there are two other cosy accommodation options. 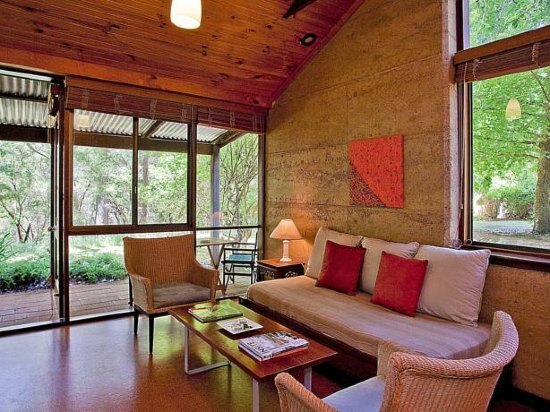 The Grevillea room, on the bottom level, is ideal for nature lovers with direct access onto the verandah. The Upstairs Wing offers two rooms, a queen-size master bedroom and a single bedroom (an additional room can be used as another single or for storage). Spread over two levels, downstairs has its own lounge/dining room with enclosed verandah and a private entrance. Recommendation: whilst all options are great – indulge, go for The Donga!